The election of Donald Trump as the president of the US has shocked people across the world. But Trump’s victory was no freak result: it is part of a wider revival of far right racist populist parties and politics, which has also been graphically demonstrated in Europe. It springs from a deep bitterness against the political establishment and against centre parties that have followed a neoliberal austerity agenda, making poor people pay for economic crisis. The racist far right has diverted this anger through scapegoating minority groups and immigrants. And Trump is very racist indeed. During the campaign for the Republican nomination, a Reuters Ipsos poll revealed that Trump backers were more likely even than other Republicans to describe African Americans as “criminal,” “unintelligent,” “lazy” and “violent”. Trump’s campaign has been toxic and offensive throughout, prompting demonstrations and protests outside his rallies. The selection of Hillary Clinton as the Democrats’ candidate – rather than declared socialist Bernie Sanders – reinforced Trump’s claims to be the anti-establishment outsider. Clinton’s life has been almost entirely spent inside the Washington political machine. She has been Secretary of State and her husband Bill Clinton has already had a go as president. You can’t get more establishment than that. Clinton is a neoliberal and warmonger through and through. They do not only think she is dishonest, they think she is a criminal, scheming, cheating snob who will sell America to the highest bidder and pocket the proceeds. Trump was able to organise huge rallies. The only thing that matched them was the huge groundswell of support and the massive rallies backing Bernie Sanders. Before Clinton’s candidacy was confirmed, polls suggested that Sanders was better placed to beat Trump than she was. Sanders was both able to articulate the bitterness against austerity and offer real solutions. He could have pulled the anger to the left. Trump, whose politics make him the most right-wing US president since the 1920s, is blatantly racist and sexist in a way that has long been considered unacceptable in public life. He has been able to build on the traditional base of the Republicans – rich, white, gun-toting evangelical Christian voters. But his populist focus on tapping anger over the increasing misery of poorer working class people has succeeded in pulling a new section of voters into his camp. 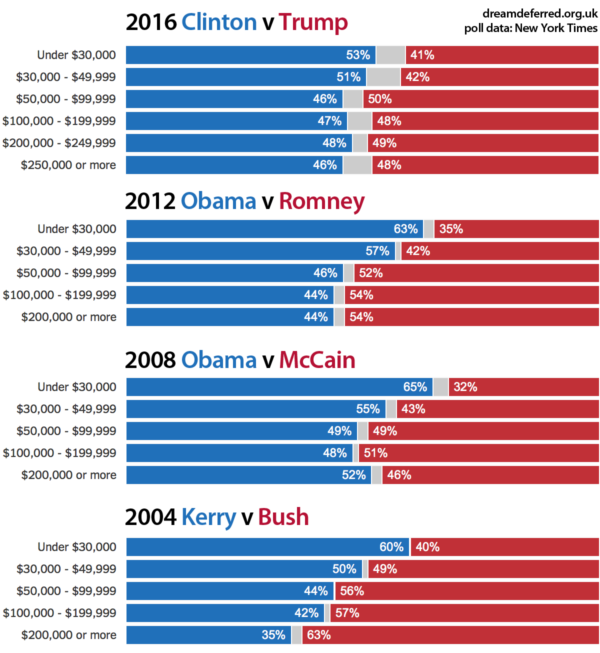 The graphs below, which draw on exit poll data, demonstrate how Trump has pulled disaffected poor, working class voters. They show that the Republican vote (red) has traditionally been stronger among richer sections of voters. But while in 2004, 2008 and 2012 the Democrats (blue) won by far the greater share of poorer people’s votes, Trump has succeeded in pulling a chunk of these votes away from Clinton. Her share in the two lowest income brackets is well down on previous Democrat candidates. Exit poll data is not totally reliable, of course, but if anything it is likely to have understated the Trump effect. The polls also found that Trump’s vote was overwhelmingly stronger among those who thought the economy was in a poor state, who felt their own family’s standard of living was getting worse and who wanted change. 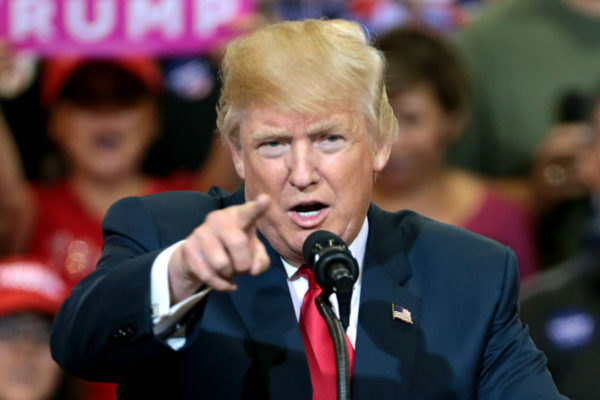 During his campaign, Trump has made no concessions to centre ground politics or mainstream opinion, reinforcing his status as a supposed “outsider”. He has staked out his position and pulled a section of ordinary people towards it. Trump is a billionaire – it is on one level astonishing that he can claim to represent the interests of poor and working class voters. But Clinton is the establishment politician who voters already know won’t help them. “America is already great,” she claimed. Of course many working class voters – especially in the African American and Hispanic communities – know Trump is a disaster and voted for Clinton, despite the misgivings of many. And not all those who voted Trump like him or agree with his more extreme positions. The election has been notable for the number of voters saying they disliked the candidates they voted for. Trump’s victory will be a boost for far right racist and fascist organisations both in the US and across Europe. Trump himself is not a fascist – the billionaire tycoon is part of the US elite. But his victory has given confidence to the rag bag of Tea Party and alt-right groups, and even more dangerous organisations like the Ku Klux Klan. In Europe, Marine Le Pen, leader of the fascist Front National who is already campaigning for the French presidency in 2017, was quick to congratulate Trump as an inspirational figure for the European far right. In the UK, far right UKIP’s Nigel Farage was also gloating over the result and warned the world to ‘prepare for further political shocks’. Trump’s election as president of the US – the world’s number one superpower – shows just how far the racist far right can go. No one can afford to be complacent now.